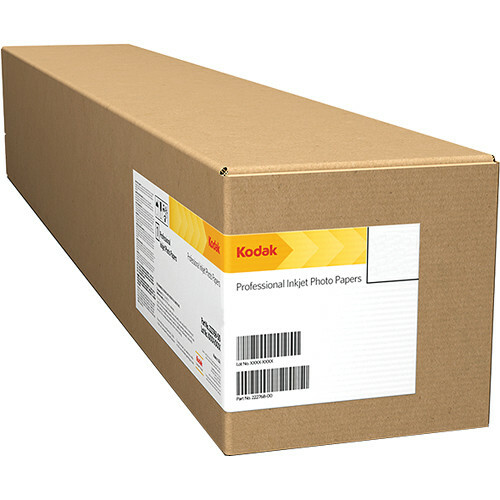 Made from an acid-free 100% cotton rag base, this 44" x 50' roll of PROFESSIONAL Inkjet Smooth Fine Art Paper from Kodak will provide a high-end look with excellent longevity for photographic and fine art prints. It features a silky smooth matte surface along with a hefty weight of 315 gsm and a thickness of 12.2 mil. It is also quite bright with a high whiteness of 110%. Additionally, it comes on a 3" core. Box Dimensions (LxWxH) 46.5 x 6.5 x 6.5"